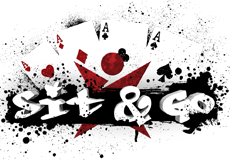 Sit & Go tournaments start as soon as the required number of players has registered. Once the total number of players required to start the tournament have joined, the tournament begins. Normally a Sit & Go is played at only one table; however there are also Sit & Go tournaments which involve multiple tables as well.